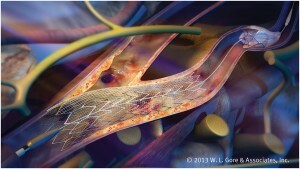 St. Luke’s Medical Center (SLMC) – home of the Texas Heart Institute (THI) – has been at the center of developing and testing several new stents and heart catheters through a series of promising clinical trials, such as the ABSORB III clinical trial, which BioNews Texas covered back in December. Following this innovative, new technology, St. Luke’s has now announced that physicians have treated the first eight patients in the state of Texas Texas with a new carotid artery stent that functions as an alternative to surgery. The multi-center Gore SCAFFOLD clinical trial is targeting the use of the stent specifically in surgical high-risk patients with potentially stroke-causing carotid artery disease. Together with W. L. Gore & Associates (GORE), the developers of the technology, physicians at St. Luke’s and THI are partaking in a national study that is seeking to compare the outcomes of patients treated with the GORE SCAFFOLD Carotid Stent versus performance data from carotid artery surgery outcomes. In all, the nationwide study will enroll 312 patients at 50 centers across the country, and will be led by co-principal investigators Peter Schneider, MD, Kaiser Permanente Medical Center, Honolulu; and William Gray, MD, Columbia University Medical Center. Zvonimir Krajcer, MD, Principal Investigator for the SCAFFOLD study at St. Luke’s and Co-Director of Peripheral Vascular Disease Services at THI, commented on the specific unmet need that the Gore scaffold could potentially fill in treating inoperative coronary heart disease: “The new Gore device is designed to be flexible, offer plaque retention and stabilization benefits, and along with bound heparin, which may provide advantages for improved patient outcomes.